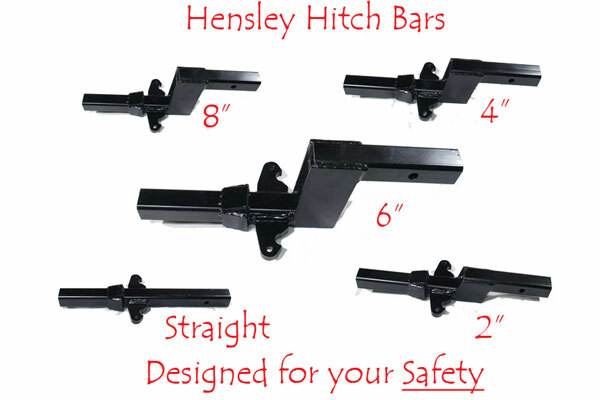 Hensley Hitch Bar Exchange - Hensley Mfg., Inc. The Hensley Hitch is unique in its design and function. That means it also requires a unique hitch bar. We’re very proud of the hitch bar design we’ve come up with at Hensley. Though it appears simple, it is quite an engineering feat in itself. The Hensley Hitch uses a solid hitch bar to connect your tow vehicle to the trailer. It comes in a straight bar, 2″, 4″, 6″, and 8″ offset. Why not an adjustable hitch bar? The Hensley Hitch does not allow the trailer to pivot on the ball. The energy that would have gone into the trailer sway is now transferred into the hitch bar. That means your 8,000lb. trailer with a side force of 20mph winds is transferring a tremendous amount of force into the hitch bar. Our engineers determined that an adjustable hitch bar could never reach the 3 to 1 safety ratio that we demanded. The hitch bar that comes with your Hensley Arrow is simply the strongest piece of steel we could design. The trade-off in convenience was minor when compared to even the remotest possibility that the hitch bar may fail. This is the one point in the system that can cause a complete disconnect from the trailer while towing. To offer anything but the strongest hitch bar design would be simply unethical. And the strongest hitch bar design is welded solid steel, not an adjustable bar. When we say the trade-off in convenience is minor, we have plenty of data to back that up. In 20 years, we’ve discovered that only about 1 in 20 Hensley owners will exchange their hitch bar. That is because most will keep the same trailer and brand of tow-vehicle for the duration of their towing life. The majority of our owners receive either the straight or 2″ offset hitch bar and never exchange them. When do I need to exchange a Hensley Hitch bar? You only need to exchange your Hensley Hitch bar when the difference between your truck receiver and trailer tongue changes by more than 2″. This only happens when you buy a new truck or new trailer. And even in those cases, most of our customers find they can use the same hitch bar. You do not need to exchange your hitch bar if you buy new tires for truck or trailer, or if you change the air-pressure in your tires as a dishonest competitor or trailer salesman might claim. What’s the procedure for exchanging a Hensley Hitch bar? When you buy a new tow vehicle or trailer, simply take the measurement from the ground to the top of the receiver on the truck, then from the ground to the top of the coupler on the trailer, just like you did when you bought your new Arrow or Cub. There’s a card in your owner’s manual as well explaining the procedure. When you have these measurements, call 1-800-410-6580 and tell the operator you wish to exchange your hitch bar. Our towing specialists will quickly calculate what hitch bar you need. Most of the time, he or she will tell you that you can just keep the one you have. If an exchange is required, the towing specialist will ask for a deposit on the new hitch bar plus shipping costs. When you receive your new hitch bar, simply put your old hitch bar in the same box and ship it back to us. You’ll be refunded your deposit upon receipt of the old hitch bar. All you’ve paid is shipping. The few owners who do exchange hitch bars usually only do it once. Rarely do we see one owner exchanging hitch bars more than one time. Inconvenient? It would be easier to adjust an existing hitch bar, but at what cost? An adjustable hitch bar is far more likely to break than a solid bar. In fact, we’ve seen competitor’s adjustable hitch bars break while in use. We will gladly put a small percentage of you through a minor inconvenience, once during your towing life, than to risk even one person having a hitch bar fail. One is one too many. No one should ever have to risk their life or the lives of others for a little convenience. If you have any questions at all about the Hensley Hitch or the hitch bar exchange program, please call us at 1-800-410-6580.